As a Sigma Affiliate, I was happy to try out the Sigma Travel Kit Naughty in Black. I tried the F80 a few months ago and loved it, so I believe in the Sigma brand. This brush set comes with seven important brushes. 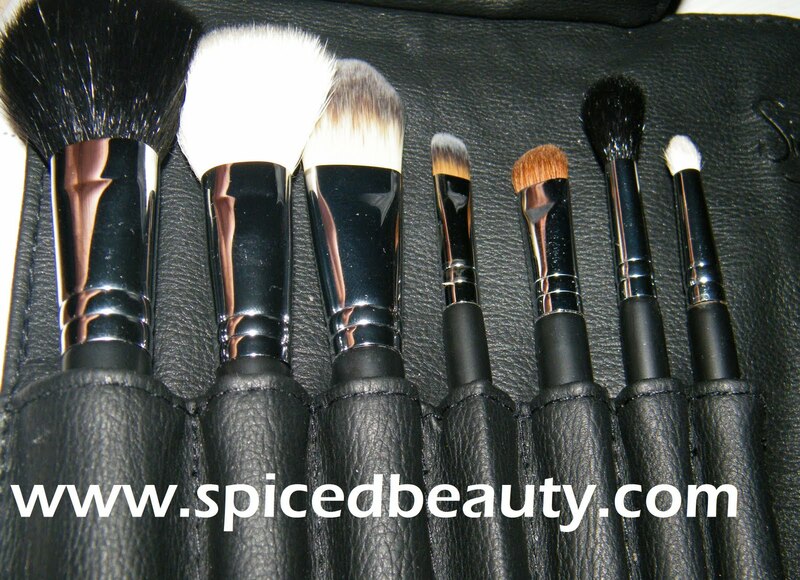 Each brush has a specialty which allows you to achieve your flawless look. The rounded, tampered, flat shape makes this brush ideal to conceal the under eye area. It is also recommended for a precise application in small areas. Synthetic bristles. "Airbrushed" finish when used to apply liquid foundation. It can also be used to apply blush, highlight shades and loose pigments. Blend of synthetic and natural bristles. I couldn't find anything wrong with this brush set. Great carrying case, quality brushes and the bonus brush is pretty good too! I can`t stress how amazing it is to have a Tapered Blending Brush in a brush set. Which brush is your favorite? I really need to get myself some Sigma brushes. I've heard nothing but good things about them. I would definitely be interested in this brush set! I really want to try the Duo Fibre one! I use liquid foundation everyday so I think it would be very helpful! And the Large powder brush would be perfect for bronzer! This is a lovely set - really perfect for travelling with for sure! Like jazzyphizz, I too haven't come around to getting my own set of sigma brushes either... I've seen too many good reviews on them and I need to have my own asap lol This set might be my first purchase! Rai & Kelly I know :D Definitely worth getting. people often compare these to MAC brushes - what do you think? Are they dupe-worthy or are they just good in their own right? Thanks for the review! Procrastinator: I think that can be a new blog post. I think the duo fiber brush can go a long way since it can be used to apply foundation, blush and bronzer. It covers all the face makeup pretty much. I really need to jump on this sigma bandwagon!